A few days ago I took a short trip to the courthouse to see what my interaction with the building would be after learning so much about the structure. I hopped on a 61D and found myself a block away from the courthouse. I walked the block to the courthouse and as I turned the corner I saw the building. It was larger and more impressive than I remembered and was extremely excited to actually go inside. 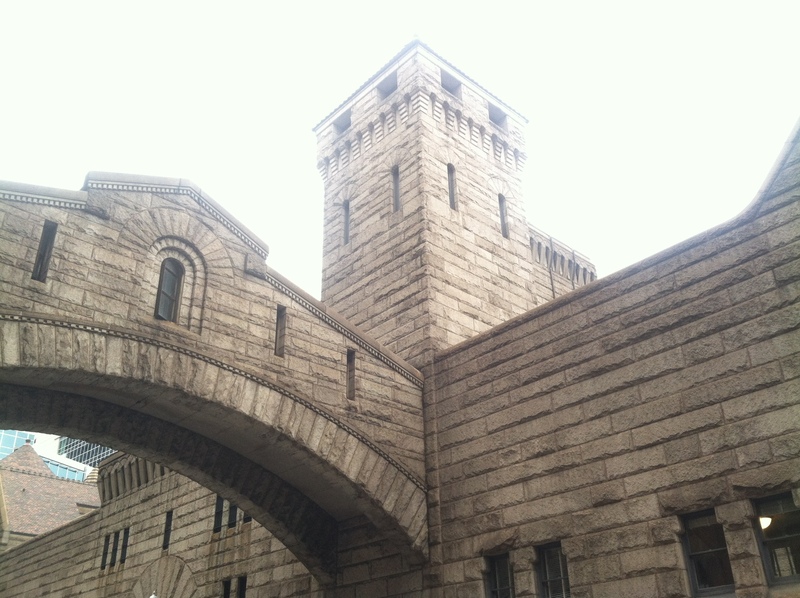 I first entered the courtyard of the old jail and reveled in how large and formidable the stones were. After my brief experience in the former jail courtyard I departed and walked around the courthouse until I reached the main entrance. I noticed many of the things I had learned over the past semester, such as the entrance of the courthouse was now in the former basement due to the ground being eliminated. I entered in the middle door and went through a security scanner. After I was cleared to enter I turned to the right and walked up a wide staircase and found myself in the main hall. It was evident to me the entrance used to lead directly to that level and was sad to think about what a great experience I had missed. Nonetheless, I was able to peacefully observe the murals painted on the wall and was greatly surprised at their vast size. For some reason I had expected them to be smaller than they actually were, but the surprise was a good surprise. In addition, there were more flags than I anticipated. The flags, though I didn’t pay too much attention to them, were very colorful and represented a variety of regions, states, counties, and cities. I left the main room and began to walk around the second floor looking for a bathroom. Unfortunately I didn’t find one but was able to peer out the vast amount of windows into the courtyard. The courtyard was pleasant to look at and is a healthy avenue for judges and clerks to break from their stressful jobs inside the building. As I went up the floors I received a better view of the two towers which were formerly used to circulate air throughout the building. They were much taller than I had envisioned and was surprised at their height. As I took each staircase even higher into the building I began to search for a hallway which would take me over the bridge. When I reached the fourth floor I was greeted by numerous signs which informed me I needed to silence my cell phone because I was near a courtroom. I quickly took a picture of the courtyard and then descended back down the stairs to the previous level. My search for the bridge was in vain and I exited the courthouse soon after and found myself on Ross Street just north of the bridge. I looked around and envisioned what the building must have looked like with the higher ground before it was removed. Regardless of how it used to look the building was still impressive and a pleasurable structure to explore. I hope never to be tried in the building and instead will prefer to explore the building in the freedom of the law. A visit is highly recommended for all because it is a relic of times past here in our very own Pittsburgh. 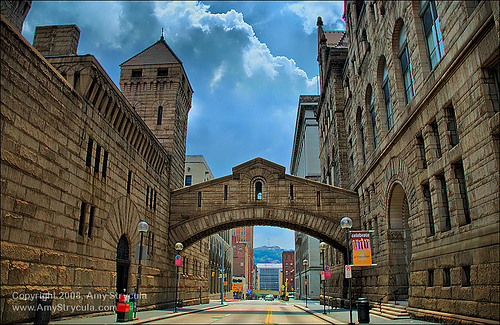 Visitors to the Allegheny County Courthouse and Jail cannot help but be awed by the bridge which connects the courthouse to the former jail complex. The bridge is clearly seen in most pictures of the courthouse complex because it visually stimulates the viewer. Consisting of stone, the bridge has four small openings split in the middle by a larger view port. A linear roof covers the structure and a curved arch supports a majority of the weight. The curved arch is similar to the Romanesque style but with an eclectic stone conglomeration. The bottom section of the bridge contrasts nicely with the rest of the bridge which causes the bridge to stand out from the sky. Besides looking pretty, the bridge also served a practical purpose. Prisoners, convicted in the courthouse, needed to be transported safely and securely to the jail. 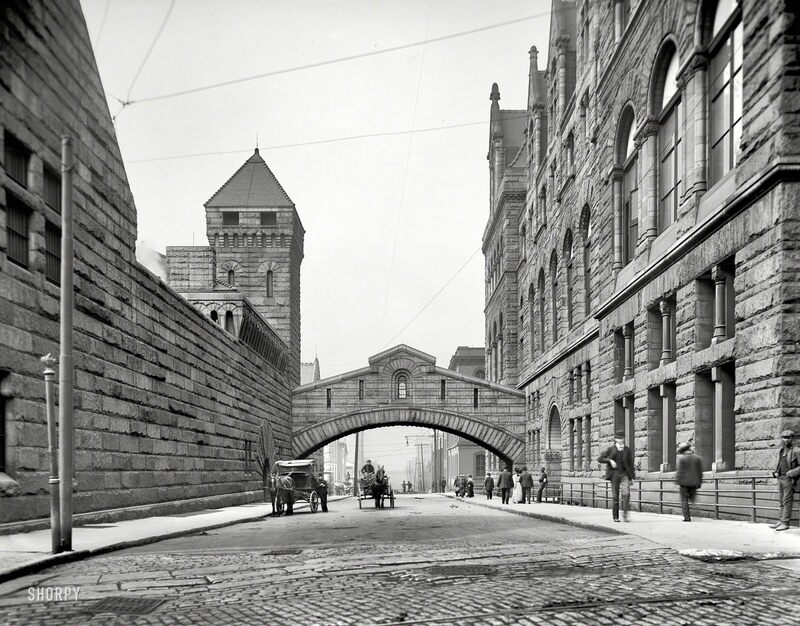 (Source) Instead of risking a journey across Ross Street the prisoners were escorted through the protected bridge to the jail where they were locked up for their crimes. It was a practical way to intertwine form and function, which is the utmost goal of architecture. Interestingly, the bridge is based on the “Bridge of Sighs” in Venice, Italy. 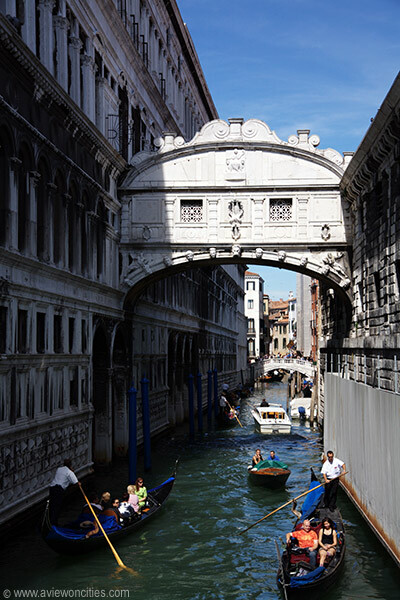 The Bridge of Sighs “was designed by Antonio Contino and was built at the beginning of the seventeenth century.” (Source) It spans the Rio di Palazzo and, similar to the Allegheny Courthouse, connects the famous Doge’s Palace with the New Jail. Doge’s Palace is a defunct palace where trials used to be held. After the trial, the prisoners were escorted across the bridge to the New Jail. The bridge receives its name because prisoners passed through the bridge, received their last view of Venice, and were rumored to sigh at the view. (Source) The bridge is recognized as the most popular bridge in Venice and legend claims if a couple passes beneath they will be in love forever. No literature analyzes if couples passing under the bridge in Pittsburgh will fall in love. As mentioned before, the appearance of the courthouse changed when Pittsburgh lowered the ground, up to 16 feet in places. The bridge went from being close to pedestrian traffic to looming over the whole area. I argue the removal of the ground enhanced the presence and power of the bridge because it became higher and thus more impressive. When the jail was converted to extra court spaces the bridge became a relic of the past, serving no function other than to look pretty. The rusticated granite, quarried in Massachusetts, contributes to the overall aura of the building. A powerful looking building, the courthouse, the bridge included, serves the perfect function of servicing Allegheny County. Visitors to the courthouse today will immediately notice the bridge as one of the defining features of the Allegheny County Courthouse, a distinguished building in all of the country. What would a discussion be about a courthouse if the place where the convicted criminals went afterwards? 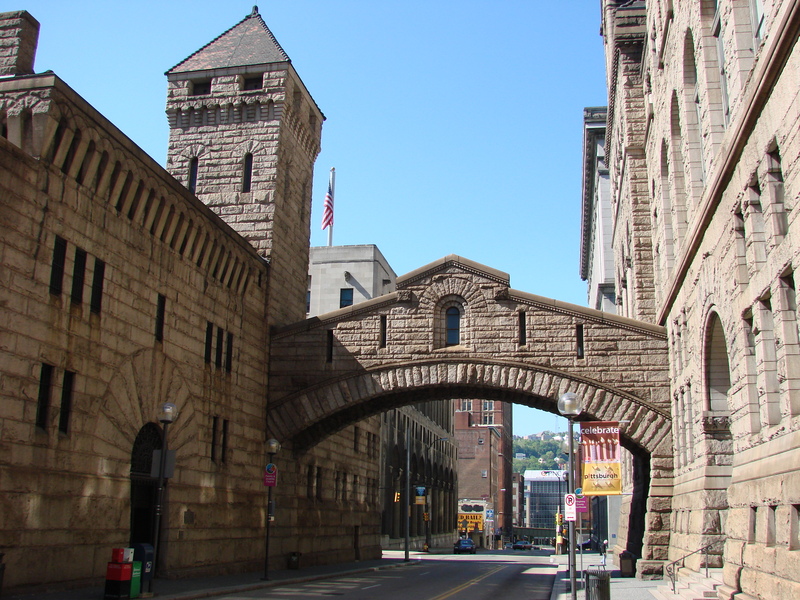 The Allegheny County Jail complex, also designed by H. H. Richardson at the same time as the courthouse, is located just across Ross Street from the courthouse and now currently houses offices for judges and their staff. The jail has an interesting history, beginning with its design. Richardson designed the jail around the Auburn model. The Auburn model is a form of a prison system which enforces strict labor during the day and solitary confinement during the night. This was thought to allow “reflection on past deeds in silence.” (Link). The model, however, was quite outdated by the time Richardson began designing the jail. A new model, the Pennsylvania model, had become popular because it was more punishing for the prisoners and more efficient. Specifically, the Pennsylvania model kept prisoners in one cell all day long, seven days a week. Each cell had its own outdoor court and each prisoner never came into contact with another prisoner. This was the model Richardson chose to ignore in favor of the Auburn model. 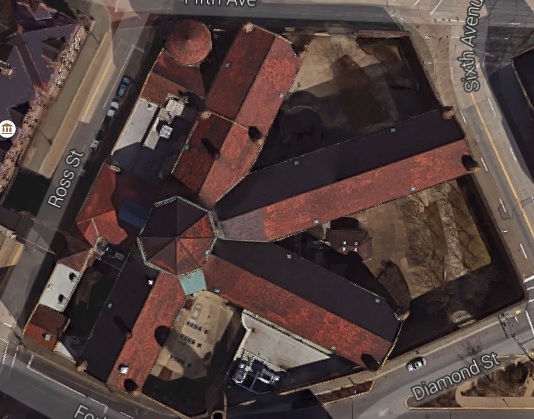 As the picture above shows, the jail has four wings, each of which was comprised of cells. The inmates exercised and worked in the walled yard during day and slept in their solitary cells at night. Aside from the prisoners, the jail hosted an array of positive progressions in the field. Alice Ballard Montgomery, a juvenile probation officer, was the first to advocate for reform programs rather than punishment for juvenile inmates. Montgomery’s ideas were taken and now form the basis of reform in juvenile prisons around the country. However, not all great things last forever. As Pittsburgh grew, so did its inmate population. The jail was not able to hold all the inmates the justice system was convicting. In addition, by the 1980’s the jail was becoming extremely outdated and was declared in 1990 to be unconstitutional. Construction began on a new complex and the new building opened in 1995 a few blocks down the road. After prisoners left the jail the interior was converted into office spaces and provided room for the Allegheny County Court of Common Pleas Family Division. Overall, the jail has a similar design, with heavy stone and an overpowering nature, as the courthouse. The jail served Allegheny County well for the time it was in use, but, as the saying goes, all things must come to an end. 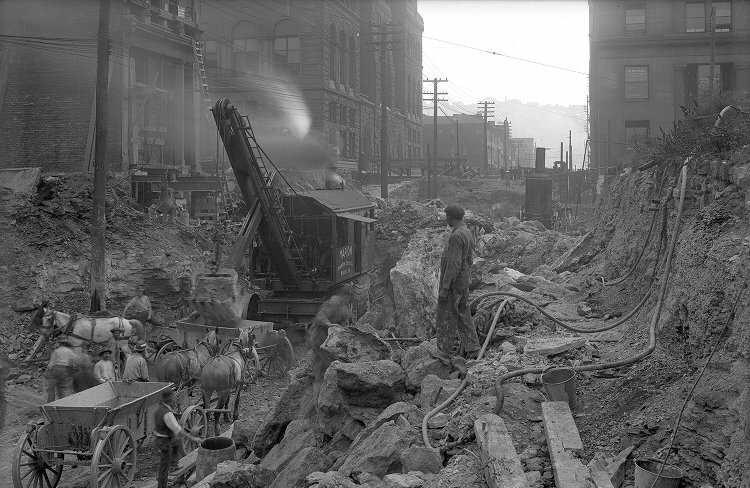 Believe it or not, Pittsburgh’s downtown area hasn’t always been the same elevation. Prior to 1912 there existed a nuisance of a hill known both as “Grant’s Hill” and as “The Hump.” The hill was extremely aggravating to workers, cars, trolleys, and horses so the city decided to remove the entire hill. Over a period of three years the hill was leveled and buildings were remodeled. 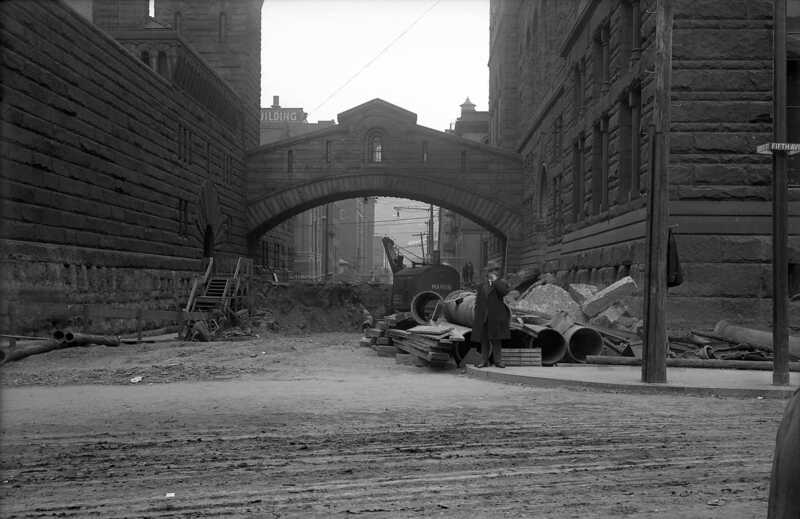 The reason this event is being documented in a blog about the courthouse is the effect the removal of the hill had on the appearance and overall experience of the Allegheny County Courthouse. While the hill still existed the courthouse was in its intended state of being with the entrance at ground level. Old photos of the bridge show a gap of a certain size between the bridge and the ground. Interestingly enough, a photo from the same perspective today shows the major difference between the bridge today and the bridge a hundred years ago. The bridge is only being discussed because of how easy it is to show the change. It is evident that the ground beneath the bridge has been lowered substantially. In fact, nearly 15 feet under the bridge was removed in the grand “hump” removal. Looking at the windows specifically in the first photo compared to the second shows a whole new level appearing after the hump removal process. 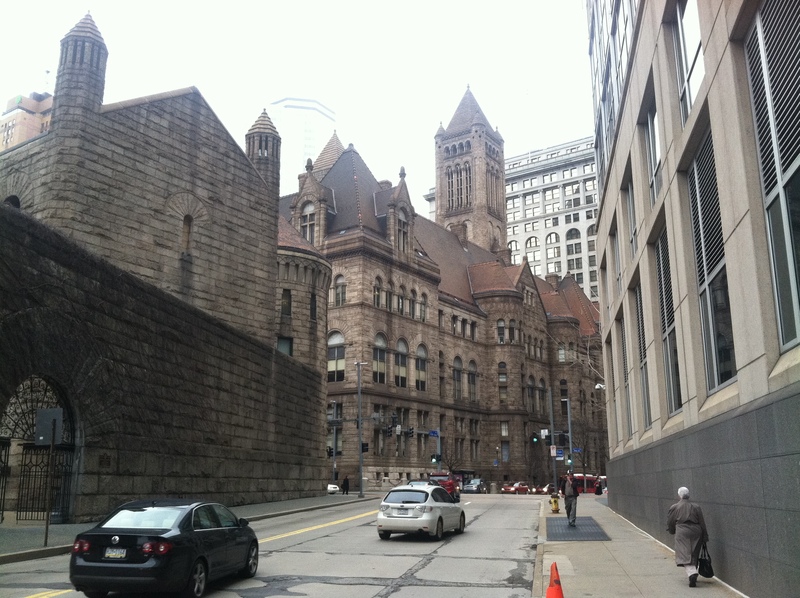 How did the hump removal affect the Allegheny County Courthouse? Here’s how. Since the construction of the courthouse was before the hump removal there was little planning for how the exterior of the courthouse would look if the land was removed. Richardson had planned a deep foundation in case the hump would be removed, which it eventually was, but there was no exterior stone. When the hump was removed and dirt was scraped away from the foundation of the courthouse, new stones were cemented along the revealed foundation. Unfortunately the stone was not the same as the existing stone, whether because it was all together a different rock or if the older stone had been weathered already. Regardless, there is still a discrepancy between the old stone and the new stone, especially on the side of the courthouse where the bridge is located. The change of stone color is not the only consequence of removing the hump; the entrances were also modified because the ground was lowered. Originally, visitors to the courthouse would enter through the traditional main entrance through the grand staircase leading up to the door. After the land was lowered, however, a larger staircase was added on which visitors would enter the building. It wasn’t much of a problem until the 1930’s when the streets, specifically Grant Street, was widened to accommodate automobiles. (Source) When the street was widened the grand staircase entrance was removed and the entrance to the courthouse was moved to the basement level. No longer do visitors to the courthouse enter through the grand doors to the courthouse but rather through the basement. The overall effect and experience of the courthouse was changed by the lowering of the hump. While the building is still spectacular it isn’t in the impressive state of being Richardson desired when he designed the building so many years ago. 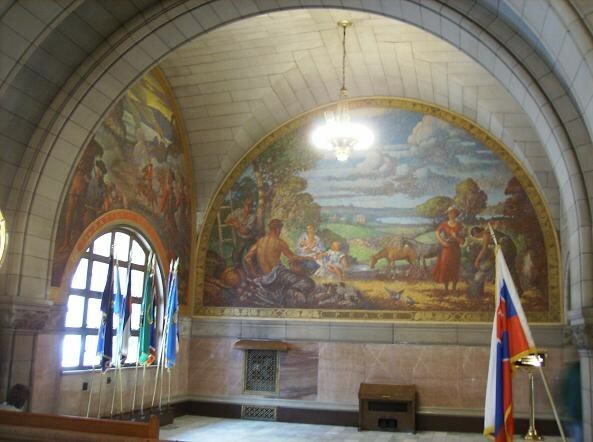 Visitors to the Allegheny County Courthouse often ask about the colorful murals up on many of the walls. 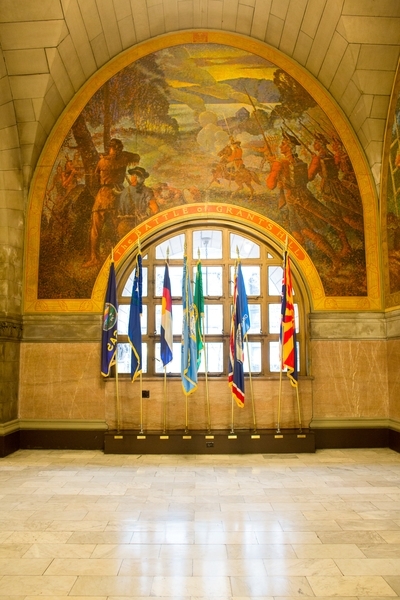 Various Pittsburgh and national events are depicted on the walls which provide a sense of energy to the building. The history of the murals is just as interesting as the murals themselves. 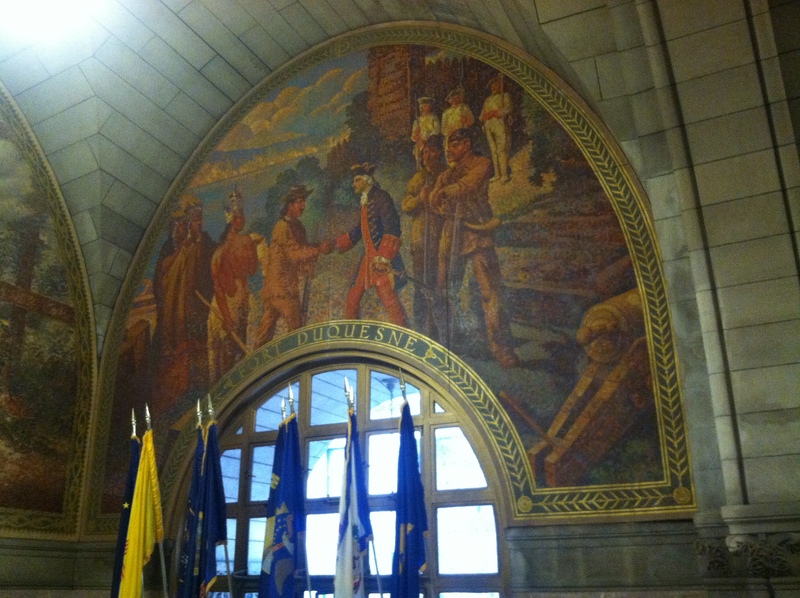 The murals were first painted by Vincent Nesbert in 1940 as part of the New Deal commission. They decorate various halls and courtrooms today in the courthouse. The photo above is titled “Justice,” an apt name considering Lady Justice is the main subject of the mural. This painting has an interesting side story which makes the painting even more special. The woman who modeled as Lady Justice, Dorthy Duke, never saw the finished product until 2000, nearly 65 years later. (Source) When she eventually saw the painting modeled after her she stated, “I don’t see a resemblance.” While she may not see a resemblance she still played a minor role in making the appearance of the courthouse interior more appealing. The above photo is titled “Industry,” and is a fitting image to represent the vibrant and wonderful industrial history Pittsburgh has. Industry and more specifically the steel mills was such a large contributor to the development of Pittsburgh that it must be recognized in the mural. “The Battle of Grant’s Hill” is a mural honoring the Battle of Grant’s Hill which was fought on the exact spot where the courthouse and jail complex stands today. Not much information exists on the Battle of Grant’s Hill so the depiction was left up to Nesbert and his imagination. What is known is that the British troops, led by General John Forbes, assaulted the French and Native American forces camped out in Fort Duquesne. The British were defeated but the French soon left, allowing the British to establish Fort Pitt. 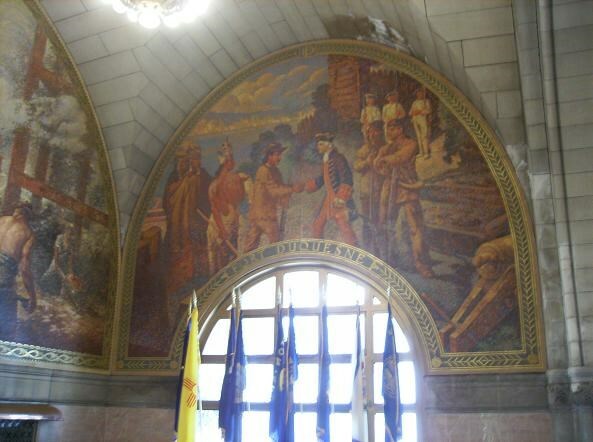 The mural above, “Peace,” is located right next to “The Battle of Grant’s Hill,” a planned location indeed. The Pittsburgh area, before the city had been incorporated, was torn by war. The French and British both wanted to settle the land between the Allegheny and the Monongahela Rivers. Eventually, after the French left, the land was left and remained peaceful continuing to this day. Nesbert wanted to express the peaceful existence Pittsburgh has had since those battles many years ago. Interestingly enough, the murals in the courthouse have not always been so vibrant. In the 1980’s the murals were covered by a thick layer of dirt and grime. Art conservationist Christine Daulton said that before she was hired to repair the murals, “I didn’t even notice the murals were in there.” (Source) After weeks of cleaning with a team of artists the murals were back to their former glory and even received better lighting to make sure they would be appreciated. Perhaps the disease focused on conveying good art is contagious: Nesbert completed “Justice” even after funding was cut off because he felt as if the message was worth it to continue painting. The next time you have to appear before a judge in shackles for that silly mistake you made, be sure to glance up at Lady Justice and know that no matter what happens justice will be served and you will probably be locked up in a room with no pretty murals. 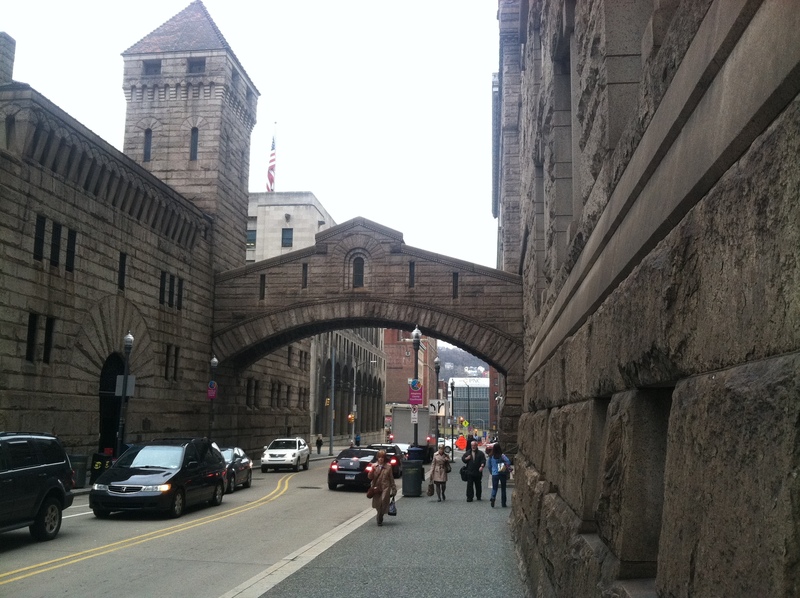 Pittsburgh is recognized for its bridges and its buildings. The history of Pittsburgh has been intertwined with architecture since the beginning when Fort Pitt was first constructed between the rivers. 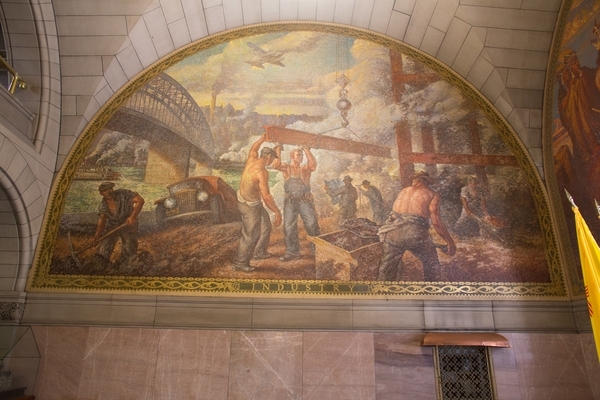 Having strong buildings has been important to the history of Pittsburgh and the courthouse is no exception. One such building is the Allegheny County Courthouse and Jail complex. Completed in 1888, the building was designed by Henry Richardson who was famous for his “Richardsonian Romanesque” style. Richardsonian Romanesque employs thick walls, emphasized arches, and spacious interior spaces. 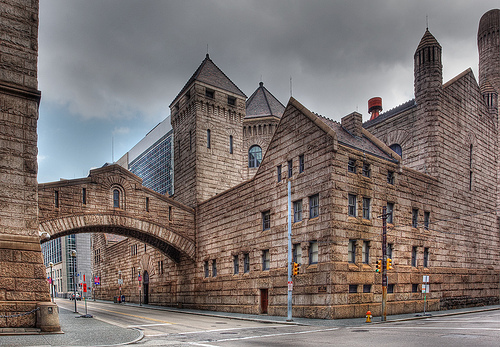 The Allegheny Courthouse is a prime example of Richardsonian Romanesque because it was constructed with all of the aforementioned characteristics. The courthouse was commissioned after the old courthouse burned down in 1882 and Richardson designed the building before his death in 1886 (he never saw the completed building). His design was selected as the winner of a contest hosted by the City of Pittsburgh. The reason for a blog dedicated to the courthouse is because of how significant it is. The building is important not only in the greater Pittsburgh area but also across the United States. For instance, the courthouse is the second most recognized courthouse in the entire United States, behind the Supreme Court building. It is also the 35th most recognized building in America. But why is it so recognized and so popular? Perhaps the iconic nature of the building comes from the integration of function and form. Buildings can be beautiful, practical, or some combination of the two. 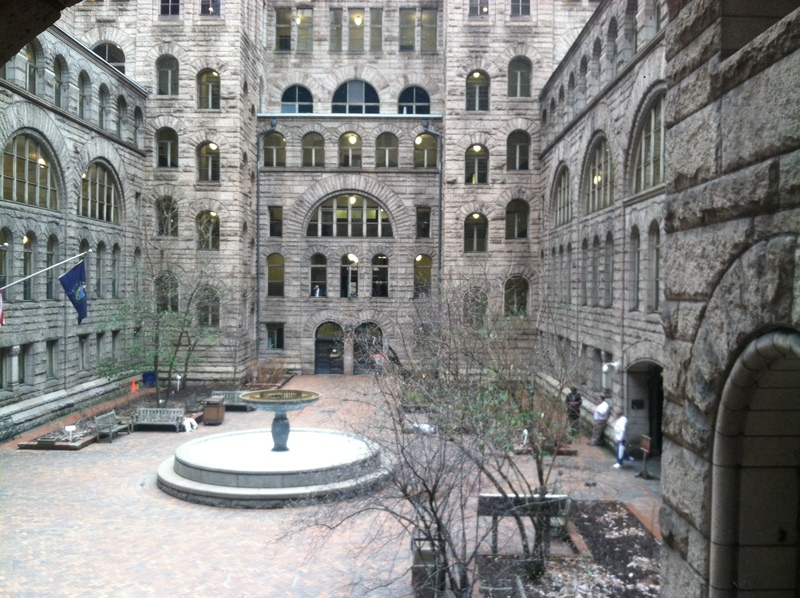 The Allegheny County Courthouse and Jail has a combination of the two, adding to its beauty. One of the beauties of the courthouse is the usage of natural lighting. An inner courtyard allows fresh air and direct sunlight to penetrate into the offices of judges and other county workers. Such lighting made working in the building much more enjoyable, especially during the dark winter months before inside lighting was efficient. In the present, natural lighting can still make the building beautiful because reliance on artificial light is limited. I am sure most people would prefer natural lighting as opposed to artificial lighting. The thick stone walls of the complex not only look appealing but also ensure the building was protected from the outside yet insulated on the inside. The stones were purposefully roughened up to create a rustic look. Characteristic of Richardsonian Romanesque, the walls make the building look heavy and powerful. Courthouses need to be strong and formidable to inspire respect from the public. The last aspect of the courthouse is the natural air conditioning. Before the days of electric air conditioning the building could become extremely hot, especially in the summer. To combat the heat, air channels were constructed into the tower where hot air could escape from. Hot air rises so the heat would leave and cooler air would enter the building. The technique was derived from the House of Parliament in the United Kingdom. 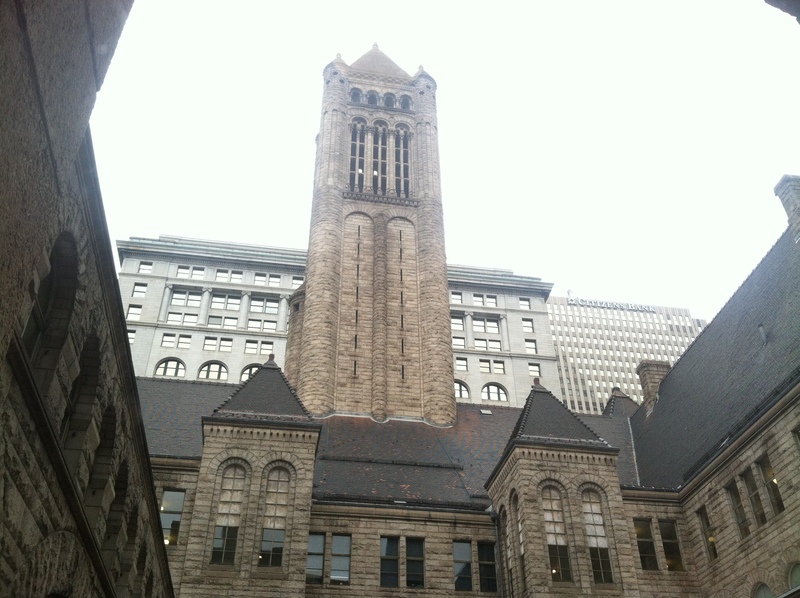 The courthouse was very influential when constructed and still adds a beautiful aspect to the downtown Pittsburgh area. The thick walls and powerful arches make the building significant and inspiring to look at.